Hey Boo’s! I want to start talking about ways that we can invest in ourselves other than just our outer appearance. Yes, looking good is always key BUT there are so many other ways to invest in SHE. Today’s SHEspiration is based on setting and achieving your goals. What is your SHE? Be sure to read this post to find out! I don’t know about you but when I can check things off a list (literally) I feel so much more accomplished! So write down your goals. Then as you accomplish them check it off the list. Now you’re one step closer to your goal. I swear when I accomplish something you can’t tell me nothing! Remember Rome wasn’t built in a day. Break your goal down into baby steps. Say for instance you want to get your Bachelor’s degree. If you wrote down 1. apply to school 2-41. the 40 classes you need to graduate 42. Get at least a B 43. Obtain bachelors on your goal sheet that might seem a little overwhelming. Instead, break it down into manageable parts so that it doesn’t seem so overwhelming. 1. Apply to school 2. Pick out 2-3 classes to take your first semester 3. Set a study schedule 4. Get at least a B. These tasks seem a little more doable and not as grandiose. Then do the same thing for the next semester until you complete your overall goal of obtaining a bachelors. This is self-explanatory, isn’t it? The KEY is to slot some time on your schedule daily (or maybe you just do Mon – Fri) to work on your goals. Slot at least 1 hour (or more depending on the tasks) and don’t forget to WRITE IT DOWN so that you can make yourself accountable! It’s easy to slack off when nobody knows that you have something to do! So spread the word girlfriend, tell your mama tell your man and tell your bestie! Just make sure they are part of your tribe and want you to succeed! Ask them to hold you to your word and they will become your accountability partners and hold you to your ish! You may not succeed from start to finish on the first try. Failure happens, Life happens, frustration happens. There’s a whole lot of things that can and will get in your way which will prevent you or TRY TO prevent you from achieving your goal. When the struggle becomes real (and it will) remember why you set your goal, to begin with. Then KEEP GOING! Every good deed deserves a reward, doesn’t it? Don’t get me wrong, you shouldn’t reward yourself for writing your goals but let’s say you finished your semester and completed ALL (or most) of your goals successfully. That sounds like a reward is in order to me. It may be a shopping trip, a piece of cheesecake (mmmm cheesecake) or getting a massage, whatever tickles your fancy, reward yourself for all your hard work! Nuff said here… Don’t stop until you have achieved your goal(s)! Hopefully, this post inspired you to get off your bootay and start working on your goals. 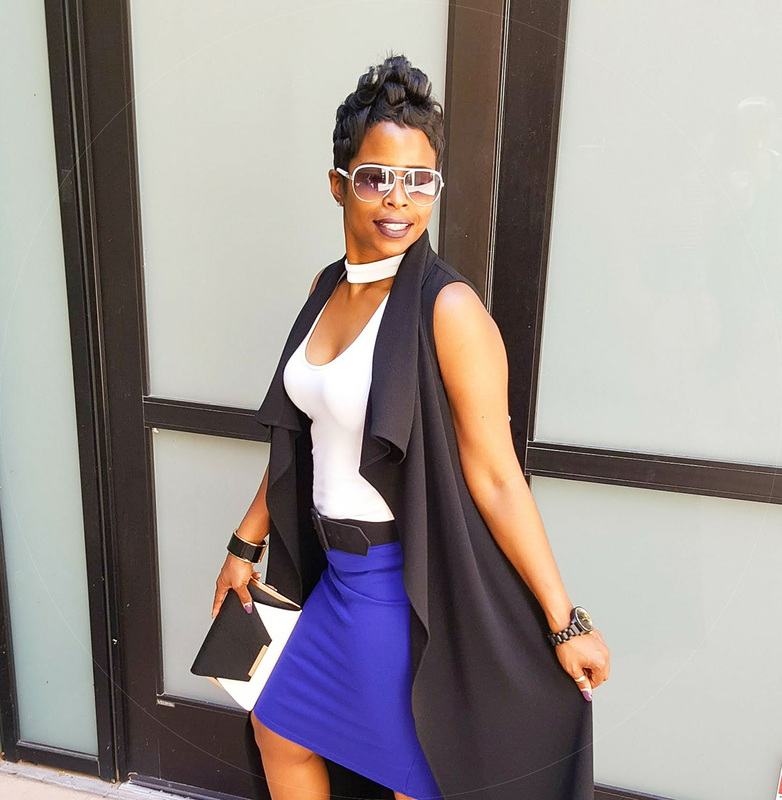 As for the Outfit Details –> The shirt and skirt are forever old but the color combo was inspired by my purse! I love all the vibrant colors and wanted it to be the statement piece. This is the perfect outfit for work, GNO or a date night with your boo thang! Girl, all these 7 speaks to my heart. Especially the first one, that’s what the bible says make it plain. I’m glad that all 7 resonate with you Bukky! Following these steps helped me get through college in a few years ago. Writing down my tasks and checking them off motivated me so much. Thanks so much for boiling it down to 7 points. Simple steps – not always easy, but simple. Thanks Kim! You know what they say… Keep it Simple. It’s amazing how simple things can be yet how hard they are to do! Hopefully having them laid out will help you achieve your goals.